Stephanie Baume, MSW, has over a decade of experience in Medicaid, with a primary focus on managed care. At SVC, now HMA Medicaid Market Solutions (HMA MMS), Stephanie has worked with multiple states on the development of new Medicaid managed care programs. She has advised clients through the design and implementation of new programming, providing scope of work development for procurements, presentation of policy options, development of quality metrics, waiver and state plan amendment drafting, readiness review and policy and operational leadership. 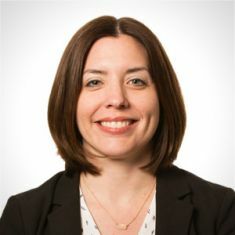 In addition to her managed care work, Stephanie has extensive experience in policy research, analysis and recommendation development for Medicaid and public health agencies on projects such as cost containment initiatives, disability processing, and 1915(i) program development and funding options. She has experience analyzing federal Medicaid regulations and ensuring program compliance. Her background also includes experience in program management, policy analysis, research and report writing. Previously, Stephanie worked with the Indiana Office of Medicaid Policy & Planning where she was responsible for oversight, coordination and administration of the Hoosier Healthwise program, a Medicaid managed care program serving children and pregnant women. In this role she was responsible for ensuring contract compliance of managed care organizations and managing all program policies and operations. Ms. Baume graduated with a bachelor’s degree in social policy from Northwestern University, and received her Master in Social Work concentrating in social and economic development policy from Washington University in St. Louis.